Youngstown State women's soccer Head Coach Fabio Boateng has added two transfers, Ernestina Abambila and Shani Jefferson, to the program for the 2016 season. Abambila will have two years of eligibility remaining while Jefferson has three years left. Abambila and Jefferson both played for Boateng at Mississippi Valley State last season and helped guide the Delta Devils to the 2015 Southwestern Athletic Conference Regular-Season Championship. "We are adding two quality players in Shani and Ernestina", Boateng said. "I am really excited they have decided to pitch camp with me at YSU." Abambila represented Ghana in the 2014 U17 World Cup in Costa Rica. She has also been invited for training camp as Ghana prepares for the U20 World Cup in Papua, New Guinea later this year. Last season, Abambila scored 14 goals with nine assists for 37 total points and was part of the nation's top-scoring offense at MVSU. A first-team all-conference performer in 2015, Abambila had three game-winning goals, posted a hat trick with three goals against Alabama State on Oct. 18 and scored goals in 11 different matches. "Ernestina is a special player who has exceptional technical ability," Boateng said. "Her ability to win the ball and help keep possession will make her a great fit for our program." 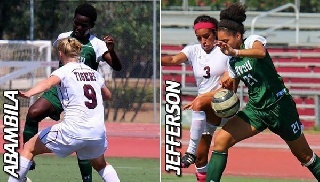 Jefferson played in all 22 matches and made 20 starts at defender for MVSU last season. She scored one goal and was a pivotal force in the backline during MVSU's 8-1-1 conference season. "Shani is commanding figure at the center of defense," Boateng said. She can be intimidating to opposing team's offensive players and is strong tackler. She finds a way to put the most dangerous attacking players in her pocket."